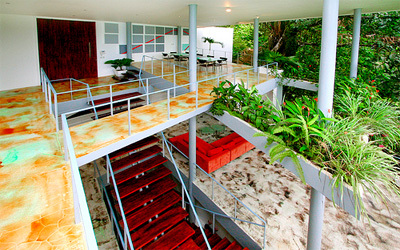 Casa Elsa is an exclusive luxury vacation rental home located in Manuel Antonio, Costa Rica. Casa Elsa combines 7500 square feet of tropical paradise with the luxury and amenities that are sure to satisfy even the most discriminating holidaymaker. Casa Elsa's uniqueness lies in its ability to offer an open concept view of the Costa Rican jungle and its wildlife while maintaining complete privacy. The vast, modern and open spaces means that the only visitors you can expect are from nature itself. Daily visits from birds, monkeys and a lazy sloth, along with a refreshing steady breeze from the Pacific Ocean will make your visit to Casa Elsa an everlasting and unforgettable experience. If you would like to preview the Casa Elsa experience, view the video below. You will see that Casa Elsa is not just located in the Costa Rican Jungle - the jungle is Casa Elsa and Casa Elsa a part of it.